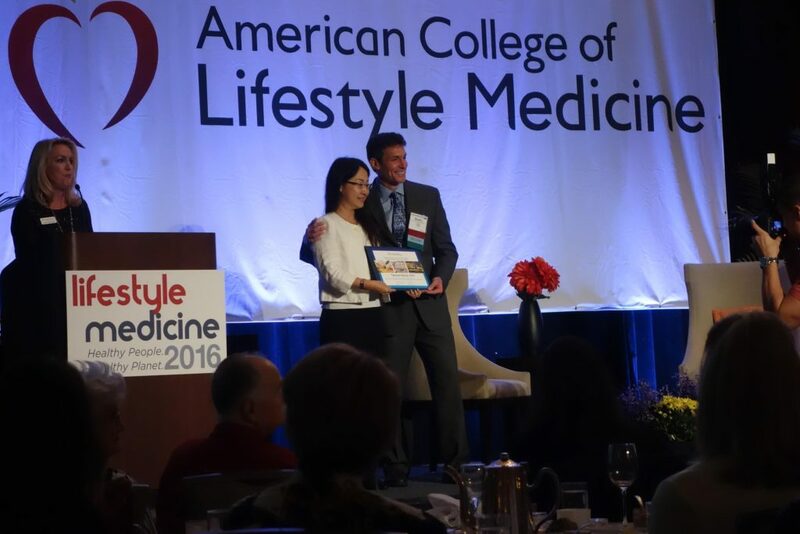 Saybrook alumna Dr. Tamami Shirai received the Research Abstract of Excellence Resident/Trainee/Fellow award at the Lifestyle Medicine 2016 conference for her recent study on U.S. and Japanese cardiac patients. Dr. Shirai’s study found that cardiac patients in the United States and Japan differ greatly in how they perceive what influences their condition. In the U.S., cardiac patients have a stronger belief that genetic influences led to their cardiovascular conditions (48.41%, p< .001). In Japan, cardiac patients strongly believe their lifestyle influenced their conditions (55.96%, p< .001). The study—which focused on 176 phase-II, cardiac rehabilitation participants in the U.S. and Japan—suggests that a belief in genetic influence is likely associated with the participant’s level of confidence in achieving exercise goals. Moreover, a strong belief in lifestyle influence is likely associated with the degree to which participants engage in enough exercise. However, in neither population did belief in genetic influence affect individuals’ dietary habits. The interest in Lifestyle Medicine is growing internationally. In fact, the Asian Society of Lifestyle Medicine will launch its first conference in March in Taipei (. This year, Dr. Shirai served as a scientific committee member for this conference. A graduate of Saybrook University’s College of Integrative Medicine and Health Sciences, Dr. Shirai is currently a postdoctoral trainee at the School of Medicine of University of California, San Diego. As a researcher, educator, and meditation facilitator, she specializes in chronic disease management using lifestyle medicine and integrative medicine. Originally from Tokyo, Japan, Dr. Shirai practices a plant-based diet in combination with Washoku (Japanese traditional cuisine). Organized by the American College of Lifestyle Medicine (ACLM) in Naples, Florida, the Lifestyle Medicine annual CME-accredited conference hosts attendees from around the world. Focusing on bringing together medical professionals to learn about integrating evidence-based approaches into practice, ACLM seeks to establish lifestyle medicine as the foundation of transformative health care.